So, the talk is a canned pumpkin shortage this year. While I'm sad to not have the abundance of canned pumpkin that we've had in previous years, I also realize that these things happen, and I need to find a way to manage. This is what I do, and what may work for you, as well. Canned pumpkin is actually something of a convenience food item. Someone else has already done the work to process the whole pumpkins, making them ready for baking and cooking. So, the first frugal hack is a no-brainer. Cook and puree your own pumpkin. With your Hallowe'en Jack o' lantern, carve it no earlier than Hallowe'en afternoon. Save any scraps in the fridge, for cooking the next day. Set it out for decoration on Hallowe'en night (maybe in a window, if you've got pumpkin smashers in your neighborhood). After trick or treaters are done in your neighborhood, put the carved pumpkin in the fridge with the scraps. Then in the morning, on November 1, cook and puree the pumpkin. Freeze in 2-cup containers. When you thaw home-cooked pumpkin, it will be a little watery. Dump the thawed pumpkin into a mesh sieve over a measuring cup. This will strain out some of the excess liquid. Then you can use this "water", mixed with powdered milk to make some of your baking liquid for the pie, or you can save this pumpkin liquid to add to soup anther day. I bought 3 whole carving pumpkins this year for 19 cents per pound. According to Good Housekeeping (source, here), 3 pounds of fresh pumpkin will yield about 3 cups of puree. A pound (2 cups) of home-cooked pumpkin, enough for 1 pie, will take 2 pounds of fresh pumpkin. So, based on Good Housekeeping's information, my cost for 1 pound of cooked pumpkin puree will be about 38 cents. For reference, the small can of Libby's pumpkin weighs 15 oz., and the store-brand is currently on sale at Fred Meyer for $1.25. But wait! I'm cooking my Jack o' lanterns. They have a slightly higher water content than sugar pie pumpkins. So, let's say it takes 3 pounds of Jack o' lantern pumpkin to yield 2 cups of puree (that's actually very close to what I've had in the past). Then my cost per 16 ounces (or 2 cups) of puree is about 57 cents. Even so, this is far less than the cost of canned pumpkin. And the bonus is pumpkin seeds for roasting! And (one more "and") if this was your Jack o' lantern that you bought anyways, it's basically "free" pie filling. The way to maximize your resulting cooked pumpkin is too cook all of the stringy goo, too. It's just pumpkin flesh, and nothing weird. I promise. If you oven-roast or microwave the pumpkin with skin on, you can scrape all of the flesh out of the cooked skin with little trouble, and little waste. Let's say you don't like cooking squash or pumpkin, too much work and mess with the cleaning and all. This is a frugal hack that I've used successfully, takes only a little work, and "stretches" whatever canned pumpkin that I do buy, by two-fold. I cook and puree carrots to blend 50/50 with canned pumpkin. Fresh carrots are about 40 cents per pound in the fall months, for me. Even with trimming the carrots, my cost per pound is under 50 cents. If I cook and puree the carrots, I can blend with purchased canned pumpkin, bringing my pumpkin/carrot-cost portion of a recipe down to about 75 cents per pound (if buying canned pumpkin for $1 for a 15-oz can). The spices in most of these recipes nicely mask any carrot taste. And no one seems to be the wiser. And actually, cooked, pureed carrots have been a substitute for pumpkins in pie, for generations. Some call this a faux pumpkin pie, others just call it "pumpkin" pie, and leave the secret with the cook. To make using carrots as easy as possible, I cook them up in large batches, puree and freeze in recipe-size portions. And preparing carrots in this way is a whole lot easier than preparing whole pumpkins for baking. If you live where sweet potatoes grow well, then they may be an affordable substitute for half of the pumpkin in your pies. I typically find sweet potatoes for about 79 cents per pound in November. Sweet potatoes are very dense, and there is very little waste, just the peels, when processing for recipes. For about 85 cents worth of sweet potato, I can get about 2 cups of puree, and yes, that's still cheaper than any canned pumpkin. Blending half sweet potato puree with half pumpkin puree (canned or home-cooked) makes a very nice pie. 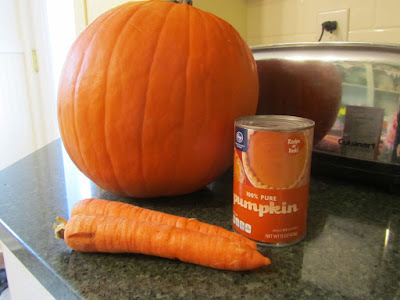 If you're using pureed carrots or sweet potatoes to stretch your canned pumpkin, then one 15-ounce can of pumpkin, which "normally" makes 1 pie, can be stretched to make 2 pies. And if you only need one pumpkin pie for Thanksgiving, but might like another at Christmas, then you can freeze half of your can of pumpkin and save it till the next month. Even without a shortage, canned pumpkin is on the expensive side for veggies, for me, at over $1 per pound. I try to keep our vegetable price per pound under 79 cents. So if I'm not finding any spectacular deals on canned pumpkin (as I did last year in the #10 cans at the wholesaler), then I use one of these hacks in my pumpkin baking. And my family is the happy to eat anything "pumpkin-y" that I bake. note: methods for pureeing cooked pumpkins, squash, sweet potatoes -- food processor, blender, hand-held blender, food mill. Using a food mill has the option of leaving the skin on the pumpkin, when cooking, according to the Foley company which has been making food mills since the 1920s. The screen on the mill catches the skin. I love this! I knew about squash, sweet potatoes.. But, i didn't know about carrots. Great idea! Thanks! Carrot pie, or "faux pumpkin pie" is an old-time solution to lack of pumpkin. But I think you get a more authentic pumpkin flavor if you blend canned pumpkin (or baked winter squash, pureed) half and half with pureed carrots. I hadn't heard about the canned pumpkin shortage yet. Thanks for the great ideas! Of course, fresh pumpkin prices are more regional. I'm not sure what Jack o' lanterns are selling for in your area, but I found them for 19 cents/lb in the NW. So, for me, using fresh pumpkins will make mroe sense. I looked into Dollar Tree canned pumpkin, too. The brand is Festival. I checked out the can, made in China (no, thank you) and I read reviews. Some folks say this canned pumpkin is more watery than the major brand of canned pumpkin, so that wouldn't be a savings for me. Thanks for the info and the link! I put it on my list to try and pick up a couple of cans of pumpkin this week. Last year, I got a pretty good deal on the Kroger brand canned pumpkin. It's a little early for that sale, though. I won't know if there are any good canned pumpkin sales, either, for a while (early November), and it will be after the Jack o' Lanterns are gone from the stores. So, for me, I'm hedging my bets and will plan on using/cooking fresh pumpkins, and if I also find a great sale on canned pumpkin, then I'll stock up on that, then. It was the Kroger brand that I bought 2 years ago, on a good sale, too. Keeping my fingers crossed for a great sale for you and me! I know that not everyone has an Aldi in their area (one only recently opened here), but Aldi carries pumpkin as a seasonal item and I have been picking up several cans each time I shop there. The cans are $.89 each and worth it to me in terms of both convenience and flavor. According to the label the pumpkin is a product of the USA. I don't know if they will also be affected, but Aldi typically only carries seasonal items until they run out so that can be hard to tell. I LOVE pumpkin and use it year round in a number of recipes. I don't usually care for sweet potato pie, although I do use sweet potatoes, butternut squash and pumpkin interchangeably in soup/stew recipes. At any rate, it's worth it to me to stock up when I can. Good info! That is a great price for canned pumpkin. We are lucky to find 15-oz cans here for $1 per can. I like to use pumpkin year round, too. It's an easy way to add some veggies to muffins/quick breads. Thanks for the price info on Aldi's canned pumpkin! Yup, that's what I pay for pumpkin at Aldi's, too (prices can vary by region, I have noticed, with Aldi's products). I think you mentioned the pumpkin shortage last week in a post--I have it on my grocery list and plan on picking up several cans tomorrow! Thank you for giving options to people who struggle with making ends meet. We no longer are in a tight squeeze, financially, but we have been in the past, and it's good to know that you can still eat well (pie!) and maintain a budget. You guys, with your Aldi's nearby, are so fortunate. I seem to recall you also stock up on chocolate chips there, each holiday baking season. I know, and I've been there, too. Members of our church operate a food bank for the community, serving a couple hundred families in the area. Supplies are always limited. It's not cheaper to begin with, but I've found that buying better-quality canned pumpkin gives us more options (and maybe more value). We get Farmers' Market brand organic pumpkin at a decent price (for organic) on-line; and that stuff has NO liquid. I actually had to change the preparation order in a couple of recipes, because the puree comes out so solid. The flavor is also very good; so I'd have no reservations about mixing that with any of your economizing substitutions. The other ways we economize on pumpkin are to make a crustless pie in a smaller casserole, and eat a square rather than a slice at a time. Or we use a third or a quarter of a can (the organic cans are small, too) in pancakes or muffins for color and flavor, and then freeze the other thirds/quarters for another batch. I might consider doing that with the couple of big Libby cans I have, too, now that we know it may be harder to get more. In addition to your excellent suggestion of crustless pumpkin pie (we call that pumpkin custard), another way to stretch that canned pumpkin is by making a pumpkin chiffon pie. Most recipes for pumpkin chiffon pie take about 1/2 cup less pumpkin than traditional pumpkin custard pie. I love winter squash, pumpkin, sweet potatoes and cooked carrots. I bought a bunch more winter squash last week and have really been enjoying them. Have a great week, yourself, Sara! Since we don't even use milk in our regular pumpkin pie, pumpkin chiffon always seems very bland (like you're getting cheated out of real pumpkin pie ), though it's so light, that aspect of it is lovely. If one's family isn't super-traditionalist in their menu desires, one could also present a lower-pumpkin-content recipe (or totally different dessert) as a way to change things up a little, as well as economizing. Our family likes pumpkin chiffon pie. I think it's sweeter. It's what my mother always made. Some years, I make one chiffon and one custard pie, and we do a taste test, to see which each person prefers. I do like pumpkin cheesecake and pumpkin fudge! One thing you do really well, Lili, is quantifying information. Many of us who have been around for a while in the kitchen, do many of the things you talk about. However, we've done it enough that it just seems intuitive now. But you provide very thorough explanations of costs and procedures that is invaluable for others. This is another example. And as far as yellow vegetables go, I love them all but sweet potatoes. Can't stand them. Makes no sense, but it is what it is. you always have something nice to say! Thank you! I can just imagine you as a mom to your sons, always putting the best spin on everything. I did not know that! But it makes sense. The very popular, home-garden butternut squash is Waltham butternut. And Waltham is in Massachusetts, right? Good deal on all of that canned pumpkin, Carol! You'll be well set for pumpkin muffins, pie, and quick bread. from last year. When we were at the store we bought 6 more cans of pumpkin. I wish I could say we got it for 89 cents a can. Thank you for the good info. I have 3 recipes for pumpkin fudge to try out. I'll post one sometime this fall/winter. I've had pumpkin fudge a couple of times and thought "how yummy!" And it's perfect for someone who can't have chocolate. Another fudge that I really like, and is very simple, is maple fudge. So great that you bought some pumpkin! I don't think we'll find any for 89 cents a can, here in the PNW, either. But we'll figure a way to manage, anyhow.